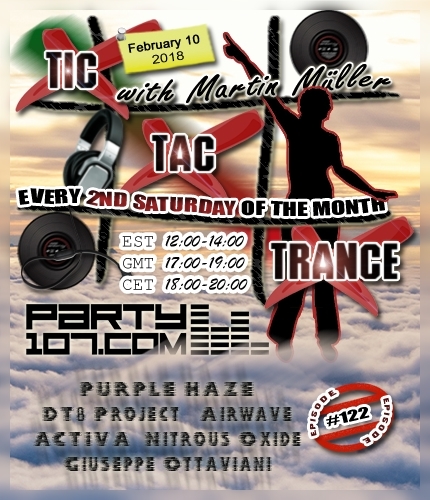 Tic Tac Trance #122 Replay available! Tic Tac Trance #122 is almost here! This episode will air on February 10 2018 on Party107.com and will feature new tunes and remixes by artists like Purple Haze, DT8 Project, Airwave, Activa, Nitrous Oxide, Giuseppe Ottaviani and, of course, many, many more! This time I’ve prepared an uplifting, progressive, techy & psychedelic 2 hours underground trance journey. Make sure to tune in!